Ice hockey is a game with two teams, and each team is consists of six players. These players compete with each other wearing ice skates on an ice rink. The main object of this game is to propel the vulcanized rubber disk, known as the puck into the goal, which is why knowing the exact hockey goal dimensions is essential to master this game. For this article, we decided not just to talk about the dimensions of the hockey goal, but about the goal itself in hopes to help you understand all the rules behind it and help you score. In addition to that, we will also talk about this famous game briefly. Let’s dive in! Ice hockey is considered to be one of the most popular and well-loved sports in the world. At present, there are over a million players that are registered to play this game in leagues and a whole lot more fans that support them in their every game. In fact, this game is also an Olympic sport. For Canadians, ice hockey is possibly the country’s most popular and most watched game. The main objective of ice hockey is for one team to score more goal than the team they compete with. The defensemen and the goaltender are majorly concerned with keeping their opposing team from scoring a goal. Forwards, on the other hand, are mainly concerned about scoring goals. They also have to be defensively responsible, whereas the defensemen have to press offensively. In order for a goal to be scored, the puck has to cross the goal line entirely under the crossbar and between the posts of the goal’s frame. In quite a few leagues, a goal isn’t counted when a player from the attacking team has a stick or a skate inside the goal crease even before the puck enters. That being said, the National Hockey League abolished this rule at the beginning of the 1999 to 2000 season. As mentioned earlier, in this game, the puck has to cross the goal line. Having done that will get the team one point. Similar to soccer, this goal also has a goaltender who tries to block any shot from the opposing team to prevent a goal from getting scored. The word goal could also refer to the entire structure wherein the goals get scored. The goal in ice hockey is rectangular in shape, which is, again, a lot like a soccer goal. Herein, the goal has a front frame, which is made out of a steel tube. Ideally, this is painted in a bright red color, but it can differ as that can depend on the league too. There are two goalposts that are vertical and a crossbar that is horizontal. In all of this, a net gets attached from the back of the frame, which helps catch the pucks that enter the goal and to prevent the pucks from entering from the back side as well. The whole goal is considered to be an inbound area of the surface of the play. 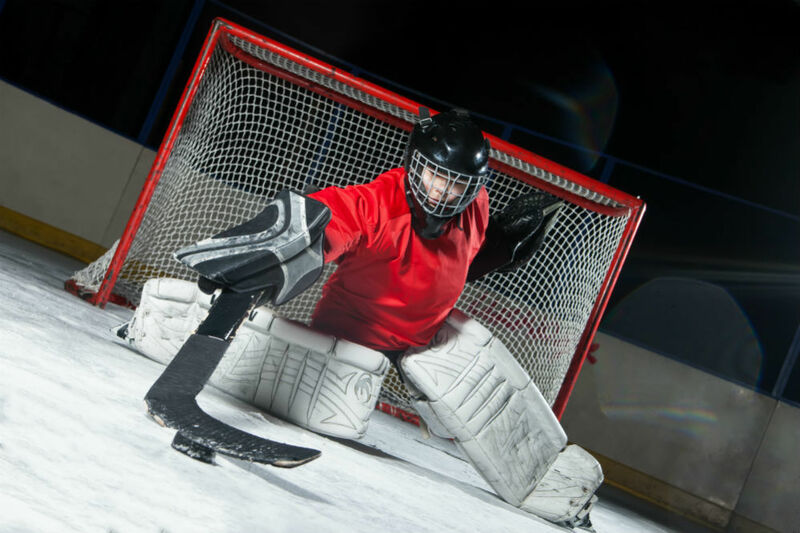 Under the National Hockey League rules, the dimensions of an ice hockey goal’s opening are 72 inches or 180 centimeters wide and 48 inches or 120 centimeters tall. The footprint of the goal is about 44 inches or 110 centimeters deep. A goal known as an even-strength goal gets, which is scored when both the teams have the exact same number of players on the rink. A PPG or power play goal is a kind of goal that a team scores during a power play, which is with a numerical advantage since a penalty gets served by either one or more of the other team’s players. An SHG or shorthanded goal is a type of goal that is scored by one of the teams that are on a penalty kill. This is when they are at a numerical disadvantage as the penalty that gets served by either one or more of the players. An ENG or empty net goal is the kind of goal that gets scored when there isn’t any goalie present to guard the net as he has been pulled as an extra attacker. Penalty shot goals is a kind of goal that is scored during a penalty shot. Herein, there is a one-on-one confrontation that occurs between the goaltender and the single offensive player due to a penalty. Awarded goal refers to the kind of goal that gets awarded automatically when the goalie was pulled, and their team commits a foul that would, in another case, have triggered a penalty shot. Own goal is pretty much self-explanatory. This is where the player puts the puck into his own team’s net instead of the other team’s, thereby scoring for the opposite team. When a goal gets scored in sudden-death overtime, it is referred to as an overtime goal. After a game has been tied, there is something called a go-ahead goal, which will put one team in front of the other. An equalizer or a game-tying goal is a type of goal that causes the whole game to get tied and is scored by the team that is down one goal. A GWG or a game-winning goal is the goal that is scored by the winning team. Hockey is one of the very few sports, along with indoor soccer or box lacrosse, that uses a horn similar to a car horn, air horn, foghorn, train horn or even a siren to celebrate every time the team scores a goal. This is a trend that started way back in the 1970s by the Chicago Blackhawks. Each horn differs based on the team. Some may even have some sound effects such as the foghorn of a ship or an alarm, or even both effects combined. Along with the horn, there is also a goal song that accompanies it. Most arenas will play sections of this song so that the crowd can sing along with it every time there is a goal scored. Knowing the hockey goal dimensions can make a huge difference as it will give your team the upper hand in the game by making it easier to score goals. We are certain that this article has given more than enough information for you to improve you and your team’s game! Good luck!